FilmToaster Dakota Film Duplicator is a CNC-crafted metal platform to mount your own full-frame DSLR with macro lens...and make digital copies rapidly and quality/resolution-wise, to limits of supporting camera. Magnetized side plates (or screw in) on each side of adjustable slot block extraneous light. Expansive single opening with reference indicator increases focusing solutions across 35mm to 4x5 formats —even rolls. 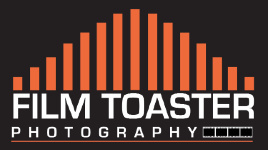 FilmToaster is designed for advanced professional photographers, film photo enthusiasts, museums, digital archiving institutions, and film-camera advocates. Rigid-yet adjustable film plane holds camera perpendicular to film. 16-gauge metal platform measures only 6x6x10 inch and custom-crafted with sixty-five CNC stages. Unique among all other concepts, FilmToaster platform rig transforms DSLRs into a desk-top digitization tool for 35mm, medium format, rolls and 4x5 sheet film. Durable Film holders - available at additional cost. Number 1 solution migrating legacy film archives into digital workflow! Now - over 5000 in use world-wide by leading photographers and museums! Accepts all brands of DSLRs. Require macro lenses 60-105mm with 4 -14 inch minimum focusing distance. Recommended 60-75mm macro lens for 4x5 captures.